Here’s a photo of Nicole Kidman and Reese Witherspoon after the Emmys at the HBO after-party. Please note the positioning of their hands around the trophy. Now please enjoy, if you haven’t already, this video that Sarah sent around to the team yesterday afternoon. Kathleen couldn’t stop watching it. Maria couldn’t stop thinking about it. Sarah wondered if they have to share custody. But since they were both producers, I’m pretty sure they each get one. 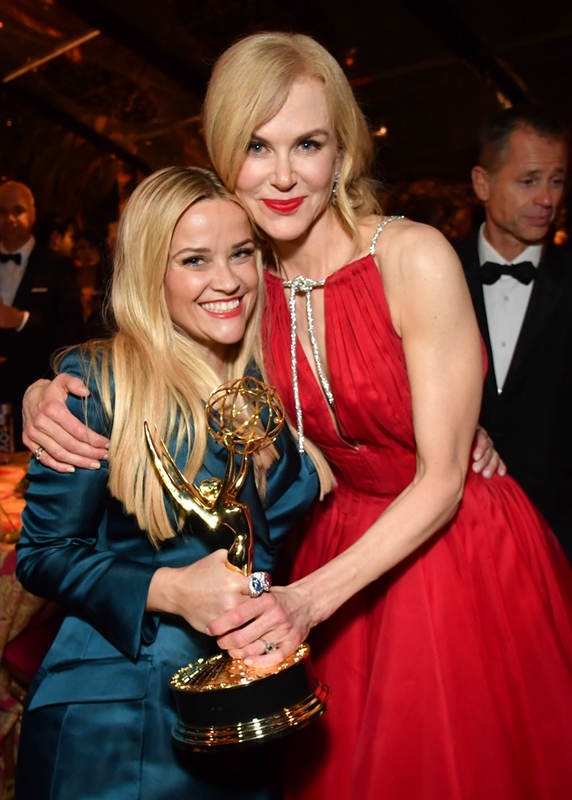 See in this shot where Nicole’s holding two (her own acting Emmy and the one for the series) and Reese has another in her hand too? It’s just that, in the moment, I guess there was only one to go around. What’s also amazing about this is that Big Little Lies was up against Feud for the Outstanding Limited Series award. And some might see that there’s a bit of Bette and Joan in what Nicole and Reese were doing with their hands when they were up on stage. Award season is the best, right? We love award season here. We love that you love it just as much. Thanks so much for visiting the site yesterday. And every day.